ANALYSE YOUR KEY FACTORS TO DEVELOP AND MODERNIZE YOUR AIRPORT INTO A WORLD CLASS AIRPORT! Airports globally are actively embarking on modernization plans and pumping hefty investments into mega airport modernization projects in order to elevate their airport infrastructure and services. This is to ensure they transform their facilities and operations into what they envision to be expected of a market leader as they serve a growing number of passengers year on year. Operational inefficiencies, long waiting times, inadequate and aging facilities, limited retail, poor accessibility and unpleasant staff attitudes are some of the common examples of negative passenger experience encountered by travellers around the world. The ideal passenger experience is to ensure a seamless travel experience in a pleasant environment for customers. Therefore there is an increasing amount of airports are moving towards the concept of Airport 4.0 that focuses on connectivity and real-time information sharing in one fully integrated digital ecosystem in order to provide world class travel experience as part of airport modernization. World's Leading Airport Modernization Summit! 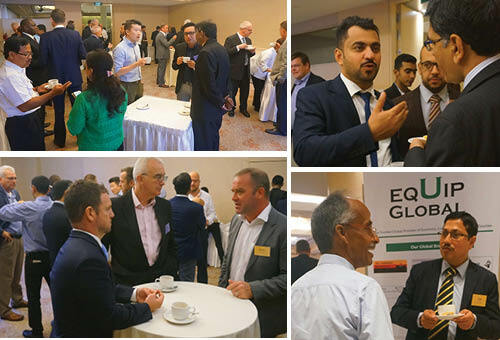 Equip Global’s Airport Modernization Summit is taking place on 18 – 21 June 2019 in Singapore, the summit aims to gather key airport stakeholders in one platform to discuss how you can overcome challenges while leveragingopportunities as your airport plan and implement airport modernization projects. As importantly, this highly anticipated summit will providepractical insights to you on how you can deliver a world class travel experience by transforming your airport infrastructures. Expect to hear from renowned airport operators who have completed airport modernization projects or airports undergoing a transformation journey whereby they will share best practices and key factors in achieving a Smart & Modern airport that enhancePassenger experience while ensuring operational effeicency. If you are keen to discuss and learn the best practices on infrastructure enhancement and capacity development or how to leverage on technologies and innovations to streamline passenger movement OR if you are facing challenges in the design and planning of airport modernization, block these dates in your calendar today and join us at the summit! WHY THIS IS A MUST-ATTEND EVENT?